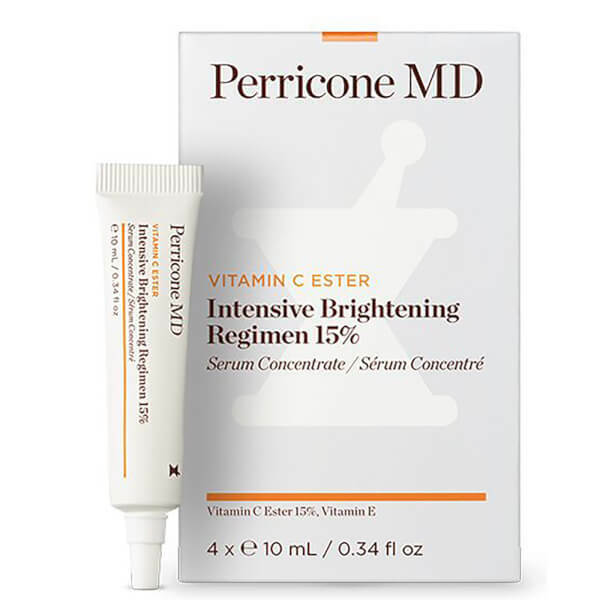 Transform your skin with Perricone MD Vitamin C Ester 15 Intensive Brightening Regimen, a radiance-enhancing serum enriched with a 15% concentration of Vitamin C Ester (a more potent and less irritating form of Vitamin C which is fat-soluble so easily absorbs for maximum antioxidant benefits). Promoting a brighter, more even toned complexion, the potent face serum penetrates effortlessly, delivering brightening, smoothing and firming properties to improve the appearance of dark spots and scars. Brightening skin with less irritation than traditional Vitamin C, the serum also contains Vitamin E to protect while improving the look of discolouration. 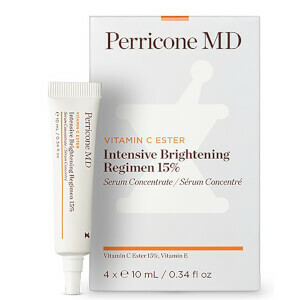 Over time, skin appears firmer and smoother with enhanced radiance and evenness. Individually packaged in 10ml tubes.